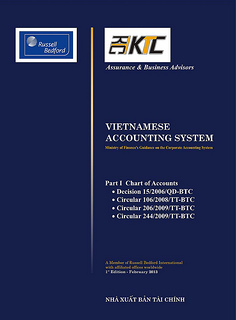 The Ministry of Finance of Vietnam ("MoF"), through the Accounting and Auditing Policy Department, implemented the Vietnamese Accounting Standards ("VAS"). These standards are based on International Financial Reporting Standards ("IFRS"). The International Financial Reporting Standards (the “IFRS”) used to be known as International Accounting Standards (the “IAS”) has been issued by the IASB. In 2003, IASB issued a standard on transition to IFRS. Standards after this period will have the designation of IFRS instead of IAS. Previously released IAS standards will maintain their original designation. Copyright © 2006-2017 by Russell Bedford KTC. All rights reserved.